It was another sultry, hot day at the east end of Tradd Street in Charleston. 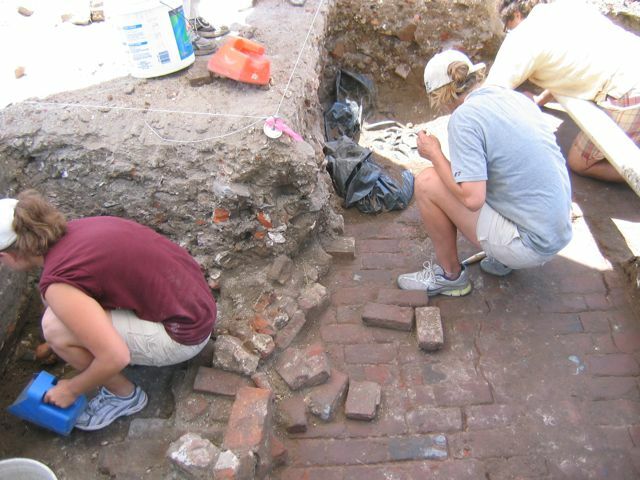 Despite the heat, the College of Charleston students performing this excavation opened a few more square units and quickly dug them down to the level of the existing units. 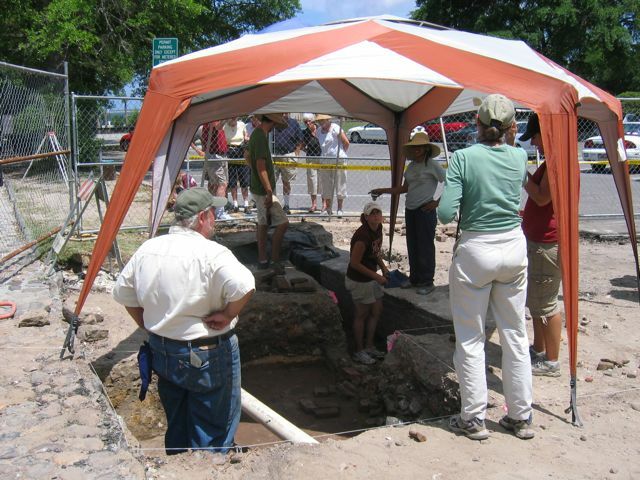 After a bit of whisking with a small broom, the result of their labor was a clearer picture of the stratigraphy of the site. The main achievement of the day was revealing a much clearer view of the brick pavers that constitute the floor of the Lower Market, installed ca. 1784–1786. 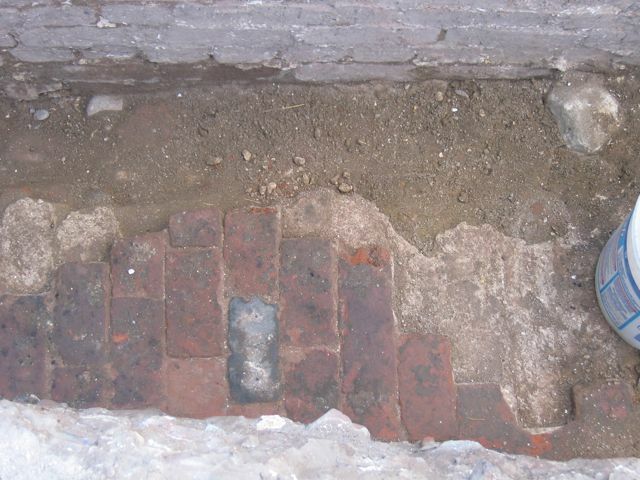 There is a clear layer of intact paving bricks throughout the open units. The bricks disturbed by later construction are seen strewn throughout the layer just above the market floor as well. So, where is the redan? 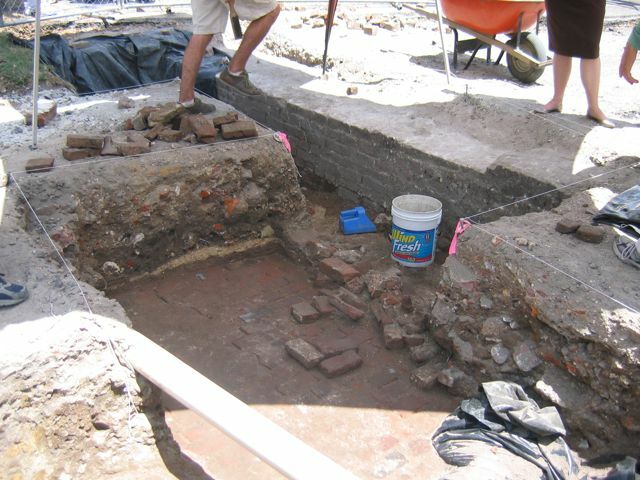 We still believe that it is directly below the bricks of the market floor, but the archaeologists wanted to clean, measure, document, and photograph the market brickwork before removing these features. A good example of these layers can be seen in this photograph. At the top of the photo is the brickwork of the foundation of Vanderhorst’s North Row, a large tenement constructed on this site ca. 1805. Just below that is an area of disturbed earth that represents the builder’s trench opened during the construction of that foundation. In the middle area of the photograph can be seen the brick pavers of the market, and the whitish bed of mortar on which those bricks rest. The top of the redan wall, we believe, will be found immediately below that mortar. Rain is in the forcast for Thursday, but we hope it will come later enough in the afternoon to permit the students to begin removing the market floor and thus reveal the top of the colonial-era redan. We visited the site at about 2:00 and there was much work going on. Nic Butler gave us an excellent intro to the project and today’s work; it is fascinating. The thin paving bricks were clearly visible to the “untrained eye.” We had a good discussion of the history of that site vis- a-vis the neighborhood and the 2 week dig in 2008. Thanks Nic! I’m sorry we won’t be in town for the June 30 program at the Library, but we will keep track of things via the website and blog. KEEP UP THE GOOD WORK, STUDENTS! And THANKS!